This book should be seen as a sequel to the Concord Mini Color Series title 7510, „HMMWV – Workhorse of the U.S. Army“. It is aimed at giving the HMMWV enthusiast an overview of the HMMWVs used by the U.S. Army in Iraq during Operation „Iraqi Freedom“. Since the first units gathered in the Gulf region in late 2002, right through until the fighting in Najaf in August 2004, there was virtually not a single U.S. Army unit which did not use an HMMWV in some form or other. The units of these foregoing divisions used HMMWVs for troop transport, as weapon carriers, platforms for surveillance and radio equipment, as command and control vehicles, as ambulances, liaison vehicles and as patrol vehicles with armor protection. Currently it is estimated that the 136,000 U.S. troops in Iraq operate some 12,000 HMMWVs. These 12,000 HMMWVs include vehicles from the basic, A1 and A2 series. Also deployed in Iraq are HMMWV Expanded Capacity Vehicle models and Up-armored models. Many HMMWVs are field modified with Armor Survivability Kits and improvised armor protection. Carl Schulze and Ralph Zwilling traveled to Iraq to bring us this photo report of the many different variants of HMMWVs currently operating in Iraq. There are many unique versions featured – ASK, Gun Truck, HHV, Special Forces GMV, LRAS, etc. 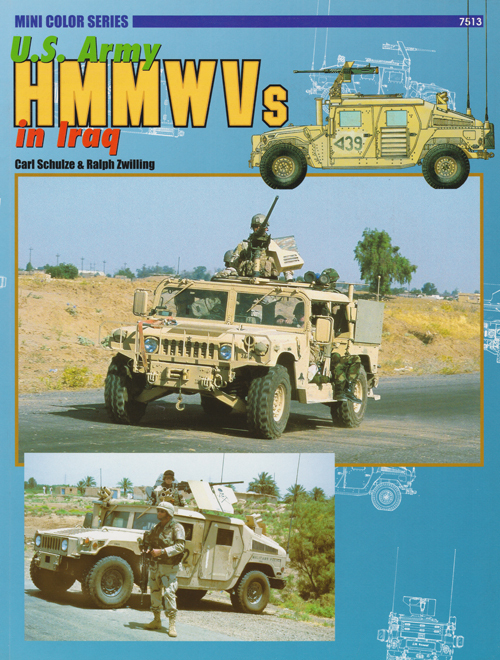 – indeed an encyclopedia of HMMWVs in Iraq.